Okay, you already know how to install the latest version of WordPress and want to switch away from the default WordPress theme look, but have no idea how to do it? Here’s the tutorial for you, complete with screenshots so even a beginner can easily follow along. With this three-step tutorial you’ll have a new blog theme ready in no time. There are a few automated ways to do this, but like our previous tutorial, we will be focusing on manual WordPress theme installation only. This tutorial assumes you already have WordPress installed on your host. It also assumes you are installing a “normal” theme, i.e. no advanced functionality that would require additional plugins or configuration. Unfortunately WordPress can’t read minds, so you’ll have to pick out the theme you want to use. Call me biased, but some of the templates on our free WordPress themes page are quite nice. 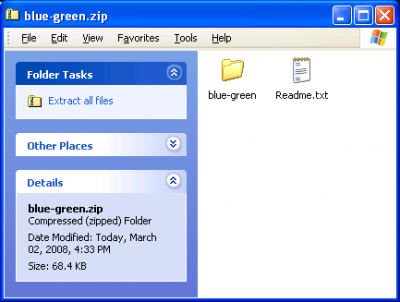 For this tutorial we’ll choose the Blue Green theme. Click the download link, and save the .zip file to your hard drive. 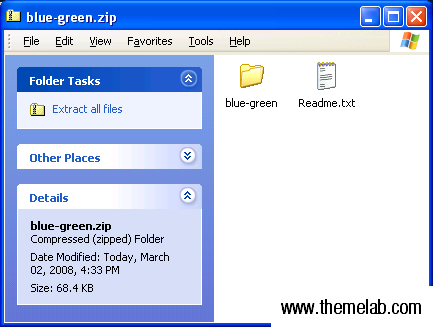 Extract the /blue-green/ folder only. All you have to do with Readme.txt is read it (which is why it’s called a readme file) and isn’t needed for the next step – uploading the theme to WordPress. Seems simple enough, right? It really is, if you know where to upload it. Use an FTP client such as FileZilla to connect to your WordPress hosting account. 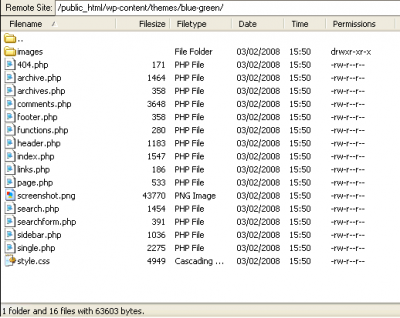 Navigate to where WordPress is installed and locate the /wp-content/themes/ directory. Upload the /blue-green/ directory it. After you’re done, it should look something like this. The hard part is now out of the way. The next and final step is to activate the theme within your WordPress admin panel. Login to your WordPress admin panel, and navigate to the Presentation tab. You should now be at a screen that looks like this. Wow, look, you can already see the Blue Green screenshot below! 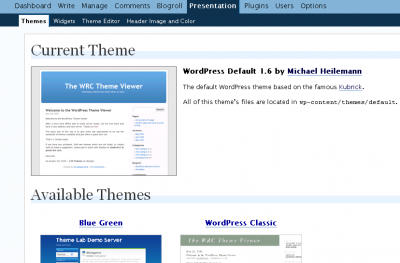 WordPress reads the directory and searches for the screenshot image and stylesheet within it. Simply click on it, and your theme is activated. That wasn’t so bad was it? WordPress makes it simple like that. If you still need help, feel free to ask in our general support forum for assistance. Feel free to leave a comment or subscribe to our feed if you liked this tutorial. Okay, to all the beginners that are CONFUSED. To even GET to this tutorial, you are assumed to have done the following. 1. Bought your OWN domain name. (eg. you went to the internet to a site like godaddy.com, or register.com, etc) and picked out a name for your website that YOU OWN, If you got to this point without using a credit card, you shouldn’t be using this tutorial. Anything you didn’t pay for is basically FAcebook and you can’t change the wordpress theme. It has to be YOUR site. 2. Now you AGAIN used your credit card and paid someone to HOST what you bought in step 1. This means you are paying a monthly or annual fee for someone to store you files ON THE INTERNET. Are you paying monthly fees…if not you can’t use this tutorial. 3. You have you domain name (eg. AllAboutMyLife.com) and it is on the internet stored on some company’s computer ready for you to put files on their hard drive. The tutorial states that you INSTALLED WORDPRESS. Did you do that? If you just logged onto some website and they asked you to enter your name and pick a password, you are not in the right place). You had to have your private website that you and nobody else is on or sharing. The disk space the company you paid should now have all the files for the bare bones of WordPress, because you UPLOADED THEM YOURSELF. NOW you are to the step of THIS tutorial. 5. Copy the files from your hard drive at home using the Filezilla or similar onto the hard drive you RENTED on the internet. The bare bones wordpress you did in step 3 has some directories already if you did it right. The wordpress THEME you downloaded and unzipped on your hard drive at home has to be copied onto the rented hard drive on the internet. It goes into the directory called themes. Thank you so much for this tutorial. I was close to pulling my hair out yesterday because I couldn’t get this figured out but now I’m set! Hi everyone, unfortunately most of the information about wordpress on the internet these days is out of date, wordpress has come a long way since the beginning and it is simple to install the latest wordpress and themes, there is no need for an ftp client … its simple…if you need video tutorials for wordpress just click on my name ..
what about if the wordpress blog is installed on example.com/blog? where do I install the theme? i have wp 2.9. i am very new to making changes to my website; and, i do not want to mess up what the web designer did. i have decided that i want to add ONE new page to my website that has a completely different theme than all of the other 20 pages. so, i was successful in creating a new page BUT it automatically has the theme of the other 20 pages. i want a brand new theme (so that i do not have to download a theme, i will go with the available themes included/offered in my wp 2.9: wp classic 1.5 theme by dave shea). how do i proceed…to install the classic 1.5 theme by dave shea…so that i do not INadvertently change the theme on the other 20 pages?? Gail Leland is right , when you customize a particular theme it doesnot effect other theme. If you have any other problem in WP you can ask. sorry – just clicking email followup comments so i get notified! 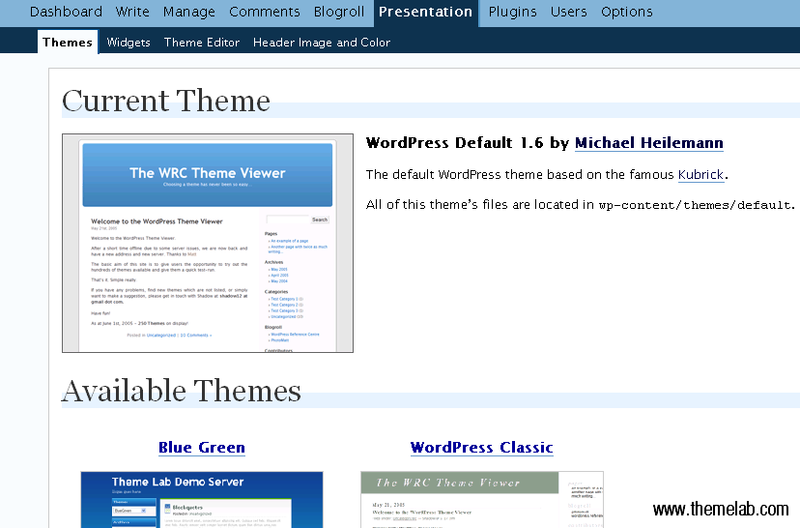 i have just installed WordPress 2.9.2 on localhost so i can play with it – as i am toitally new to WP. I made a couple of changes to the Default theme e.g. added stuff to sidebar and footer. i then successfully downloaded blue green theme and installed + actrivated succfessfully – simples! however, i expected that the changes i made inthe default theme would be carried over to the new theme. this has not happened. i get the vanilla theme with no changes. does that mean that if ai develop a blog on one theme and then activate another theme, i will have to apply all changes and content again to the new theme? Yes, if you make changes to one theme, those changes only affect that one theme. If you switch themes, you’d have to make those changes again. The only way to modify a theme like this would be using a child theme, but that’s a bit more advanced (which you don’t need to worry about now). Thanks for this tutorial! I followed both How to install wordpress, and how to install a wordpress theme! They both worked amazingly for me, and now my site is up and running! I can’t thank you enough Leland 😀 -Much Love? Thanks! Easy Set up! But not for people hosting on word press itself. Hi, I’ve a few questions regarding installing WordPress themes. Correct me if I’m wrong. WordPress.com doesn’t allow its users to upload their self-created themes. However, it does allow them to customise (a little) or tweak the premade layouts. As for WordPress.org, I have to download the WordPress software and install it to a server, through ftp? Let’s say, I use Ripway. So after installing WordPress, I can upload my own theme (which I made using Photoshop, not a premade layout, but my very own layout). All this is possible by using WordPress platform on a different web host right? In this sense, I can still use WordPress and use my own themes FOR FREE, without the need for upgrade or purchasing of any web host deals? Pls reply me soon! :)Thanks! 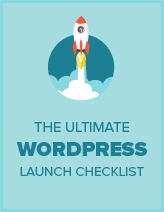 However it’s quite easy to figure out what to do if you have some experience with WordPress. Very helpful, big thanks, that’s exactly what I needed! I like the tutorial, thanks for making it, i understand right now. @Courtney: With WordPress 2.8 you will be able to automatically download themes from the respository, kind of like how you can install plugins with WordPress 2.7. And just a note, the hosts WordPress “recommends” at http://wordpress.org/hosting/ are mostly affiliate links, including the one to Go Daddy. Have hosting w/ Go Daddy who although Word Press recommends them as a host will not help with the very confusing uploading of themes or anything else WordPress! When I download the desired theme to my computer it is UNZIPPED. So when I tried to use the FTP Client folder and move the file from the local to the remote in my Go Daddy Hosting folder, it did not download. Then Go Daddy refused to tell me how to unzip file or do it properly! Word Press is very difficult to use and I hope that future versions will be more user friendly. There are currently so many side steps and constant refrencing to one’s hosting site. This makes things unnecessarily difficult. Themes and templates should simply upload to the site directly and everything should be able to be done from one’s Word Press dashboard! Okay, this tutorial is a little out of date, since it was written for WP 2.3. There is no “Presentation” tab anymore, but you can still change themes under the “Appearance” menu. Also another note, THIS IS FOR SELF HOSTED WORDPRESS BLOGS ONLY and not WordPress.com users, sorry. @John: Well, that would be an issue with your theme, and it doesn’t really have to do anything with the information contained in this tutorial. May I ask what theme you’re using? E-mail me through my contact form. Nice blog I will follow u from now on!